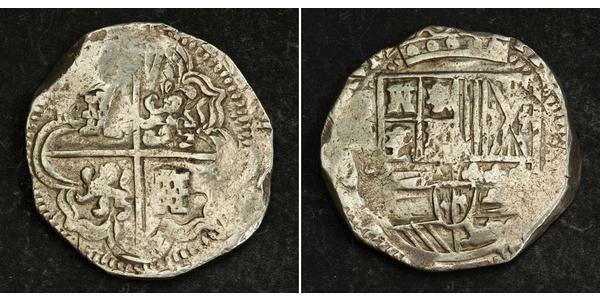 1610s-1630s, Bolivia, Philip IV. 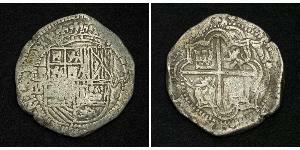 Spanish Colonial Silver 8 Reales Cob Coin. R! 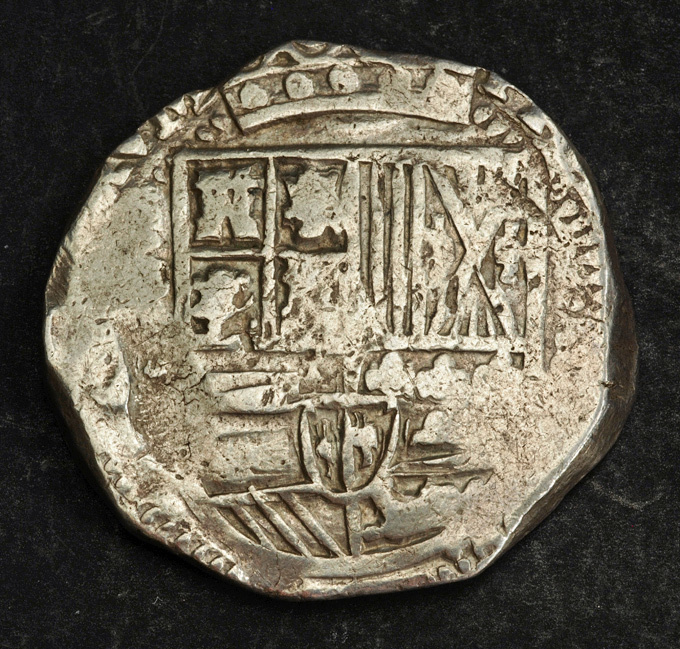 Obverse: Cross of Jerusalem with lions and castles in quarters. All within border of pellets. Reverse: Coat of Arms of the spanish line of the House Habsburg. 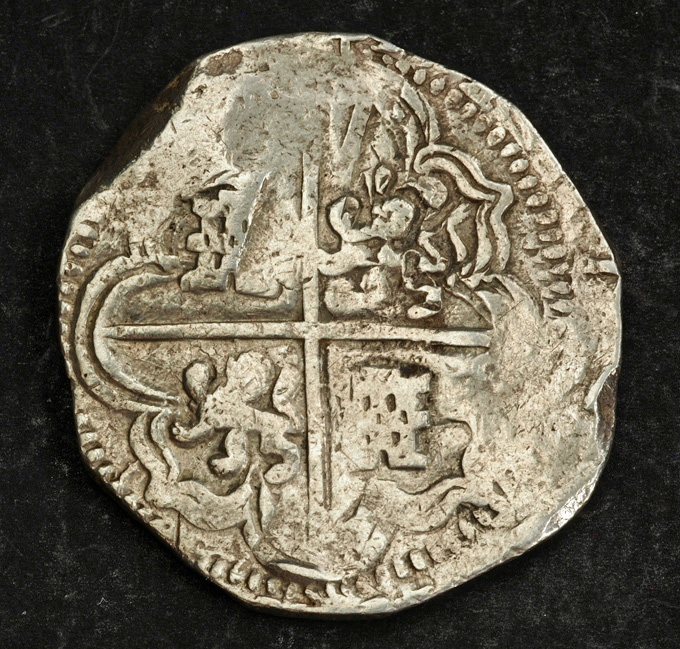 The first coinage of the New World and what comes to mind when we think of Pirate Treasure are pieces of eight. These first coins, often called cob coins, were made from roughly cut planchets (blanks) by striking them with hand dies. The word Cobb comes from a simplification of the Spanish phrase, Cabo de Barra, which translates as, from a bar. 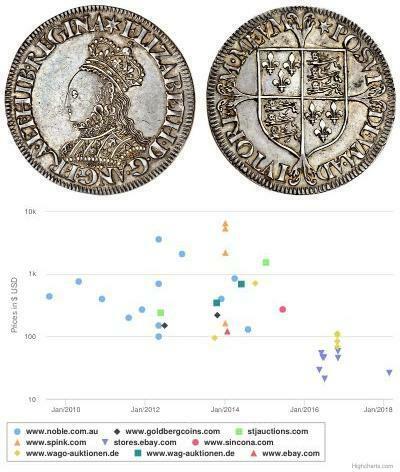 After the coins are struck, they are weighed by an assayer who cuts off any excess Silver which is why most coins have some of the impression cut away. 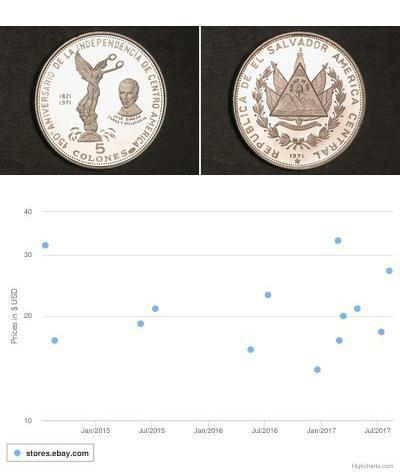 Due to this method of manufacturer no two coins are alike and many are collected for their unique shapes alone. 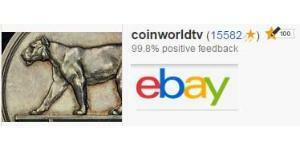 The Cobb coin, like anything that is no longer available is becoming very scarce and hence more valuable. The few remaining Coins are the last vintage of the glory days of pirates and Treasure hunting and are fast disappearing into private hands. Philip IV (Felipe IV, (8 April 1605 – 17 September 1665) was King of Spain between 1621 and 1665, sovereign of the Spanish Netherlands, and King of Portugal until 1640. On the eve of his death in 1665, the Spanish empire reached its historical zenith spanning almost 3 billion acres. Philip IV was born in Valladolid, and was the eldest son of Philip III and his wife Margaret of Austria. Philip IV's reign, after a few years of inconclusive successes, was characterized by political and military decay and adversity. He has been held responsible for the decline of Spain, which was mostly due, however, to organic causes largely beyond the control of any one ruler. Philip certainly possessed more energy, both mental and physical, than his diffident father. His handwritten translation of Francesco Guicciardini's texts on political history still exists, and he was a fine horseman and keen hunter. His artistic taste is shown by his patronage of his court painter Diego Velázquez; his love of letters by his favoring Lope de Vega, Pedro Calderón de la Barca, and other immortal dramatists. He is credited, on fairly probable testimony, with a share in the composition of several comedies. He also commenced the building of the Buen Retiro palace in Madrid, parts of which still remain near the Prado. His good intentions were no avail to governance, however. Feeling himself not yet qualified to rule when he ascended to the throne at age 16, he allowed himself to be guided by the most capable men he could find. His favourite, Olivares, was a far more honest and capable man than his predecessor the Duke of Lerma, and better fitted for the office of chief minister than any Spaniard of the time, perhaps. Philip, however, lacked the confidence to free himself from Olivares's influence once he did come of age. With Olivares's encouragement, he rather busied himself with frivolous amusements. In December 1st, 1640, a uprising took place in Lisbon expelling King Philip IV of Spain (Philip III of Portugal) from the Portuguese throne, giving it to the Braganzas. This was the end of 60 years of the Iberian Union and the beginning of the Portuguese Restoration War (lost by the Habsburgs). By 1643, when disasters falling on all sides led to the dismissal of the all-powerful minister, Philip had largely lost the power to devote himself to hard work. After a brief struggle with the task of directing the administration of the most extensive and worst-organized multi-national state in Europe, he sank back into indolence and let other favourites govern. His political opinions were those he had inherited from his father and grandfather. He thought it his duty to support the House of Habsburg and the cause of the Roman Catholic Church against the Protestants, to assert his sovereignty over the Dutch, and to extend the dominions of his family. The utter exhaustion of his people in the course of perpetual war, against the Netherlands, France, Portugal, Protestant forces in the Holy Roman Empire and Great Britain, was seen by him with sympathy but he considered it an unavoidable misfortune, since he could not have been expected to renounce his legitimate rights, or to desert what he viewed as the cause of God, the Church and the House of Habsburg. He was idealised by his contemporaries as the model of Baroque kingship. Outwardly he maintained a bearing of rigid solemnity, and was seen to laugh only three times in the course of his entire public life. But, in private, his court was grossly corrupt. Victorian historians prudishly attributed the early death of his eldest son, Baltasar Carlos, to debauchery, encouraged by the gentlemen entrusted by the king with his education. This shocked the king, but its effect soon wore off. Philip IV died broken-hearted in 1665, expressing the pious hope that his surviving son, Carlos, would be more fortunate than himself. On his death, a catafalque was built in Rome to commemorate his life.